Creating a healthy and productive beef unit has been challenged over the last few months by inclement weather conditions and poor yields of both crops and grassland. In order to restore farmers faith in growing beef, the Wooler based division of SAC Consulting are to host a Beef Event in partnership with Lilburn Estates. 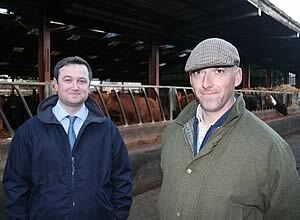 Lilburn Estate Farm Manager Dominic Naylor (Right). The specialist event will bring together SAC Consulting’s expert advisors as well as a number of other renowned speakers to discuss the future of the beef industry and how changes in the short term can improve your beef herd health and productivity. Taking place on Monday 19th of November, at East Horton Farm near Wooler in Northumberland, by permission of Lilburn Estates Farming Partnership, and an integral part of the day will be a tour of the Lilburn Estates Beef Unit. With beef prices high, farmers and breeders should be looking to maximise their outputs from their herds. Starting the line up of speakers is Dominic Naylor, Farm Manager of Lilburn Estate who will give an overview of the entire farming enterprise. “The farm management team at Lilburn Estate are very pleased to be hosting this event. Cattle are an integral part of the successful mixed farming operation here at Lilburn Estates and this is an opportunity for beef farmers both local and from afar to experience an excellent field day that includes on farm discussions and a seminar component”. The Estate runs 1200 breeding cows and a similar number of progeny. Bulls are finished for one year and heifers for eighteen months; the farm keeps in the region of 300 replacement heifers. There are also 11,500 breeding ewes and around 3,000 acres of combinable cropping. “This is the first event of of this type and it gives farmers and breeders the opportunity to see firsthand one of the largest livestock farming enterprises in the North of England. We are going to hold a firm focus on health in the beef herd, feeding the suckler cows and feed safety, all this we feel are key factors at present that contribute to increasing on farm productivity and outputs. For any farmer looking to improve their herd health and therefore outputs this is a day not to be missed”. This is a day of two halves; the morning is an on farm field day with a large portion of interaction as attendees rotate around three different stations with presentations from experts in their fields. Stephen Corner of KW feeds discussing feed sources for now and the future. Rhidian Jones and Ian Cairns of SAC Consulting will discuss options for finishing cattle, feeding in wet weather and Cross Compliance. Urs Schaeli from Cheviot Vets will look at cattle health pre and post housing. The main aim of these interactive sessions is to give delegates the opportunity to take part in open discussion of the finer details of each topic. Following the on farm discussions delegates will travel to Hetton Estates Village Hall for lunch and the key focus of the afternoon will be herd health. Speakers include Richard Jeffreys, SAC Vets covering topics such as BVD and Johne’s Disease, Ian Pritchard on the Premium Cattle Health Scheme and lastly a brief update on ELS schemes from Neil Carter. “Johne’s Disease cannot be treated and the animal has to be culled or else they die. This inevitably results in higher replacement costs for the herd. If your herd is closed or you are selling stock for breeding it is vital to sell them with assurance that can be obtained through accreditation. Accreditation can be obtained through the Premium Cattle Health Scheme operated by SAC and licensed by CHeCS, a leading cattle health scheme in Great Britain. It allows a planned approach to animal health in conjunction with your veterinary practitioner”. The event is sponsored by MSD Animal Health and is supported by KW Feeds, Murray Farmcare, Fearing and Carrs Billington. Beginning at 10.30am and concluding around 3pm to book a place please call 01668 283 363 or email Sandra.dunn@sac.co.uk.